I rarely fall asleep quickly when its bedtime. It generally takes me 15 to 30 minutes to get to sleep. About a year ago I decided to listen to some relaxing music before sleeping. I woke up two hours later with the music still playing in my earbuds. Several months later I started downloading audio books and podcasts to my iPod. Like most time-crunched people, I didn’t find time to listen to all the audio on the iPod. I’m a reader and have tried to reserve 15 – 30 minutes for reading before sleep. One night my eyes were tired so I listened to a book rather than reading. I woke up two hours later, listening to the book. Lately I put the earbuds in and start a good audio before I turn out the lights. I’ve discovered that I drop off to sleep more quickly when I’m listening and, when I don’t drop off to sleep more quickly, I’m learning or being entertained as I wait for sleep to infiltrate my senses. It’s a win-win situation. Here’s what I’ve learned about easing into sleep hooked to my iPod. Listen to relaxing audio, whether music or spoken word. I don’t listen to music that is fast or hot (Hendrix) — I listen to music that is smooth and soothing (Pat Metheny). For the spoken word, I don’t listen to dramatic, high energy audio (Mad Money by Jim Cramer), but instead I listen to voices that are conveying meaningful information without being loud and emotional (Eckhart Tolle is a good example). Lock your iPod (disable the controls) so that the volume and/or selections won’t change if you roll over on the iPod while sleeping. Make a selection that is 15 – 60 minutes long. I’ve awaked at 3am with U2’s Vertigo blasting in my earbuds, because the music I had selected had ended but I hadn’t limited my selection. When I wake up with the earbuds in, I pull them out and stuff the iPod and the earbuds under my pillow. This the quickest way to get everything out of the way and not disturb others (spouses, pets, etc.). If you sleep with cats (I do), you have to make sure your earbuds are under the pillow. (Look at this link to see why: Punctured Earbud). Often I often don’t remember much about the spoken word audio that I was listening to, but I like to think that I absorb some of it while I’m asleep. Please leave a comment if you listen to audio on a portable device while falling asleep — share your experiences. …require all new cars to have, right next to the speedometer, a mileage meter. And put the same number on an LCD display on the rear bumper. Once there’s an arms race to see who can have the highest number, we’re on the right track. Children’s responses to What Does Love Mean? "Love is when my mommy makes coffee for my daddy and she takes a sip before giving it to him, to make sure the taste is OK.
"Love is when you kiss all the time. Then when you get tired of kissing, you still want to be together and you talk more. My Mommy and Daddy are like that. They look gross when they kiss. " "Love is hugging. Love is kissing. Love is saying no"
When you tell someone something bad about yourself and you’re scared they won’t love you anymore. But then you get surprised because not only do they still love you, they love you even more." "There are two kinds of love. Our love. God’s love. But God makes both kinds of them." I let my big sister pick on me because my Mom says she only picks on me because she loves me. So I pick on my baby sister because I love her." Bill McDonough, visionary and practical at the same time, comments on nuclear power. Recently I was asked to give a talk about sustainability at the White House to over 40 federal agencies. So I gave my talk and showed these slides, and afterwards I was asked, "Mr. McDonough, what do you think of nuclear power? A lot of environmentalists are now in favor of it because of concerns about global warming." And I said, oh, I like nuclear power. I’m a big fan of fusion. I think we should invest lots of money into nuclear power and consider using it for all our energy needs. And look—we’ve already got the perfect nuclear power plant. It’s 93 million miles away. It’s wireless. The construction costs are zero. Its operable lifetime is infinite. It’s right there. What are we waiting for? Emmanuel Osofu Yeboah has faced a lot of obstacles in his life. With persistance and some helping hands he has had an amazing journey. On May 5th, 1977, in Ghana, West Africa, Emmanuel Osofu Yeboah was both born – and abandoned. Upon discovering Emmanuel had a severely deformed right leg, Dickson Kwadjo Ofosu, disgraced by his son’s disability, walked out on his family. Emmanuel’s mother, Comfort Yeboah, was advised to kill her son. But rather than surrender to society’s perception that disabled children are the result of a family curse, or a punishment from a deity for a parent’s past transgressions, Comfort neither killed Emmanuel, nor sent him to the streets to beg, as expected. Instead, she enrolled him in school and taught him to believe that he deserved the same treatment, opportunities and privileges as able-bodied Ghanaians. …on July 14, 2005 Oprah Winfrey presented Emmanuel and his friend, Jim MacLaren with the prestigious Arthur Ashe Courage Award at the ESPY’s. The two men received an emotional, five-minute standing ovation. Previous winners include Muhammad Ali, Jim Valvano, and Billie Jean King. The Archdruid Report describes an energy future in the middle ground between today’s energy inefficient American lifestyle and the apocalyptic collapse envisioned by the doom sayers. It looks like deep insight combined with common sense to me. Denial about the implications of our oil addiction will boomerang on us. This kind of realistic guidance is most welcome. One of the many ironies of our present situation is that today’s energy-squandering lifestyles actually give us more room for maneuver as energy supplies decline. Especially in the United States, we waste so much energy on nonessentials that a large fraction of our energy use can be conserved without severely impacting our lives. Consider the suburbanite who mows his lawn with a gasoline-powered mower, and then hops in a car to drive down to the gym to get the exercise he didn’t get mowing his lawn! From Christmas lights and video games to three-hour commutes and Caribbean vacations, most of the absurd extravagance that characterizes energy use in America and other industrial countries only happens because fossil fuel energy has been so cheap so long. Mature technologies and proven lifestyle changes already exist that can save half or more of the energy the average American family uses in the course of a year. Nearly all of them were already on the shelf by the late 1970s. At this point it’s simply a matter of putting them to work. Since most of them require modest investment, and prices for many of the materials involved are likely to soar once energy prices shoot up and conservation becomes a matter of economic survival for all but the very rich, getting them in place as soon as possible is essential. Steve Pavlina provides 13 reasons not to watch, read, or listen to the news. I quit listening to talk radio while driving three years ago and I am much more relaxed when I get out of the car. If you want to understand his reasoning, click on the link. News is a waste of time. Dave Pollard describes intentionality: individuals have the potential for self-determination, even though many powerful forces attempt to herd the various groups, tribes, and organizations into the preferred direction. What is required is a sense of ‘purposefulness’ — having an intention. A nice reminder for anyone who feels discouraged. …We watch corrupt politicians with enormously powerful and wealthy connections steal elections. We watch horrifically destructive mega-polluters lie and deny in hugely influential media, media that they have bought with their ill-gotten gains. We watch corporate, political and celebrity criminals literally getting away with murder. We watch churches and other social organizations turned into astonishingly effective propaganda arms of devious extremist political groups, in both affluent and struggling nations. We watch psychopathic fear-mongers trump impassioned voices of reason in the war for public opinion. It is easy to get discouraged, to believe that mere intentionality, no matter how impassioned, rational, altruistic and intuitively sensible it may be, is no match for the clout of those that care about nothing, that seek only the soulless acquisition of even more wealth and power, for its own sake. But then we realize that, in today’s immensely complex world, where the levers of power are increasingly ineffective against multitudinous and asymmetric opponents, and where neither social nor ecological systems can be managed, predicted, analyzed, or even significantly steered, no one is in control. Our world is like a vehicle accelerating ahead on its own momentum and careening wildly from side to side, with no braking or steering mechanism available to the powerful bullies and rich gamblers who still believe themselves to be in the driver’s seat. The rich and powerful are failing in nine out of every ten things they try to do. Their attempts to gain popular support are universally backfiring in the court of public opinion, as the truth comes out despite their machinations to obscure it. Every time they think they have a new ploy or a new technology that will accomplish their goals, its implementation instead creates a dozen new unforeseeable problems that they cannot constrain or even influence, and which takes them even farther from their intended objective. And we realize, too, that the only person who has influence over our personal ability to Let-Self-Change is us, the lonely, disconnected bag of skin and organs that is the individual. To the extent we let others make our decisions for us, that too is ultimately our choice. And even though our minds are principally in the service of the organisms that comprise our body, and our decisions are mostly made instinctively and subconsciously by them for their benefit, still we have significant influence over what we do. Here’s a link to a YouTube video of Stephen Wiltshire drawing the city of Rome. 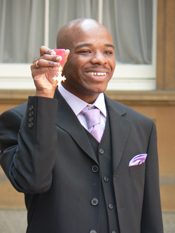 Autistic Londoner Stephen Wiltshire is a 32-year-old artist who observes and draws what he has seen. Aged eight, Stephen started drawing cityscapes after the effects of an earthquake (all imaginary) as a result of being shown photographs of earthquakes in a book at school. He also became obsessed with cars and illustrations of cars at this time (his knowledge of them is encyclopaedic) and he drew most of the major London landmarks. Nicknamed The Living Camera, Stephen drew a perfect aerial view of London when he was 11, and after only one helicopter ride.